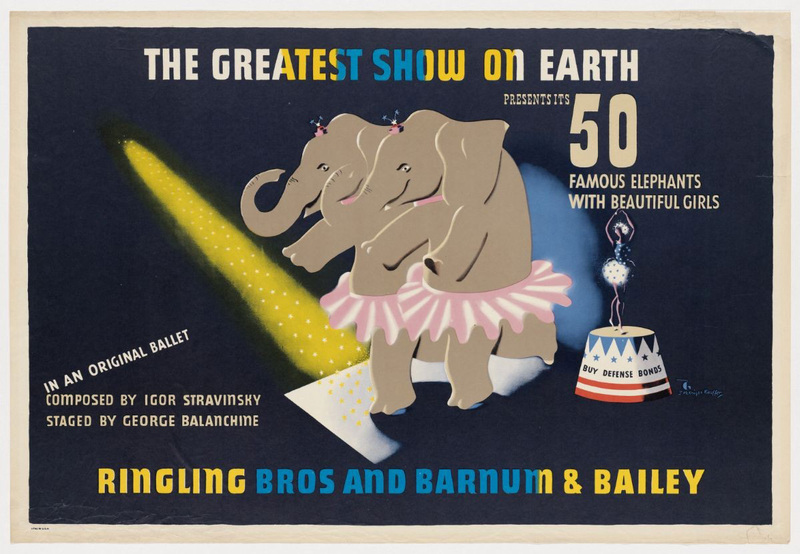 By the 1940s many regarded the circus as old fashioned, prompting the Ringling Bros. and Barnum & Bailey Circus to bring in a bevy of talented artists and designers to modernize the show. One of the most unusual and entertaining results of this effort was the grand “Ballet of the Elephants” staged for the 1942 touring season. The act featured fifty elephants in pale blue tutus accompanied by female dancers dressed in pink performing a routine that was choreographed by George Balanchine. Balanchine convinced his friend Igor Stravinsky to contribute the score, but the open tonalities and desultory rhythm of his “Circus Polka” proved problematic for elephants used to the driving beats of the circus band. Despite the obvious challenges of choreographing the four-minute routine, the act proved popular with audiences captivated by the novelty and grace of the elephant ballet.